View cart “2575 Magnetic Armature” has been added to your cart. – Unit ships with one (1) EMG-01A gun, one (1) 6S LiPo battery, one (1) 9-round magazine, as well as one (1) 40A fuse. – Actual unit is black in color. 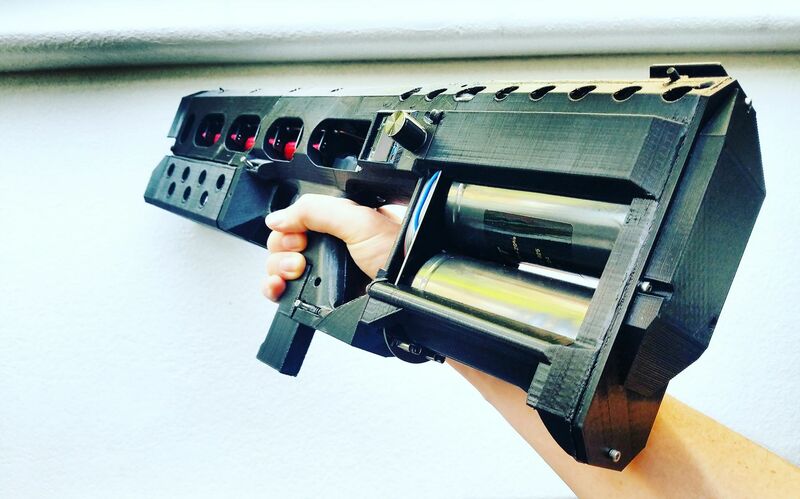 The Arcflash Labs EMG-01A (Electro-Magnetic Gun – 01 Alpha) is an 8 stage, IGBT switched, low voltage capacitor augmented fully automatic coilgun. It features 8 IGBT stages, each with an independent infrared optical gate. The fire control and sequencing of the coils is controlled by a nanosecond-precise microcontroller switching IGBT gates which allows for firing up to 4 rounds per second at >45m/s. 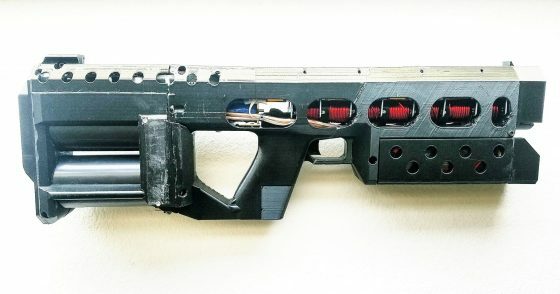 The EMG-01A is configured to ONLY fire 0.25×0.75” steel projectiles (dowel pins). Arcflash Labs recommends the use of 2575 Magnetic Armatures, but any 0.25×0.75” steel dowel pin should work. 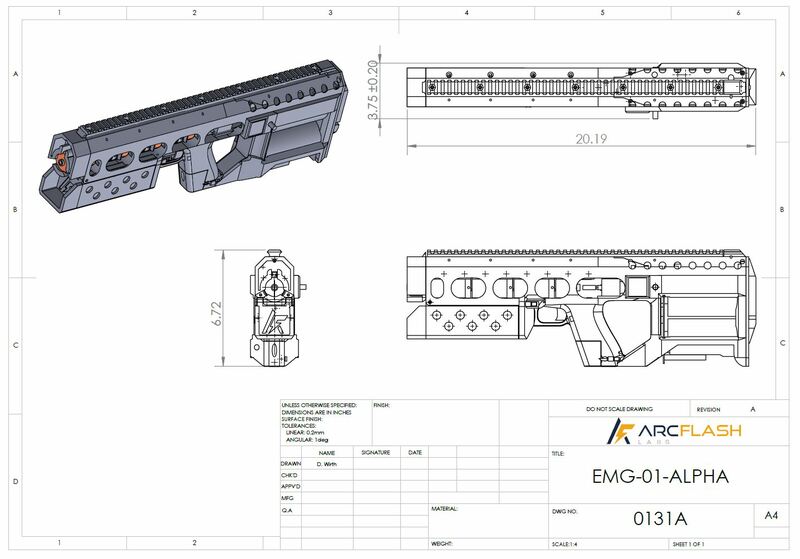 The EMG-01A is shipped standard with a 9 round coil spring magazine which can hold up to 9 rounds single stacked, and fire up to 6 rounds on full-auto. 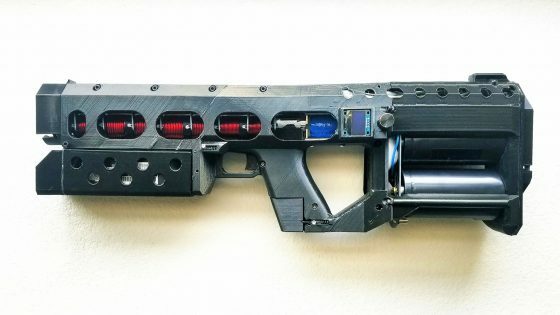 The gun is also shipped standard with a 1500mAh 6S Lithium Polymer battery (charger sold separately) which can provide power for over 100 shots before needing to recharge. Cannot ship to the following states: Delaware, Illinois, New Jersey, Rhode Island, District of Columbia. The following counties: King County (WA). The following cities: Seaside (CA), Bridgeport (CT), Stratford (CT), New York (NY), Brooklyn (NY), Bronx (NY), Staten Island (NY), Queens (NY), Glen Oaks (NY), Floral Park (NY), Yonkers (NY), Buffalo (NY), Rochester (NY) Philadelphia (PA), York (PA). If you are a resident of a state which is highly restricted but you are outside the restricted city or county in such a state, please contact us before ordering. Approx. $85 due to additional insurance and signature verification. Dependent on location.